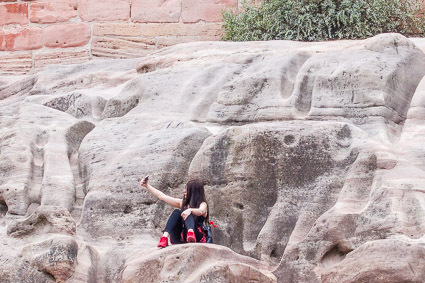 ABOVE: A tourist takes a selfie beneath the walls of Nuremberg's Imperial Castle. 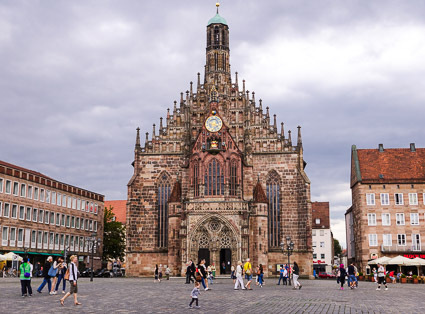 Nuremberg is a city of 495,000 people in Franconia, a region of Germany that has been part of Bavaria since 1803. 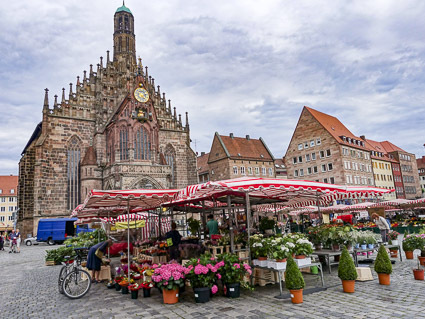 It's also a busy port for river cruising (see our Nuremberg Port Guide), both for cruises heading east to the Danube and west toward the Rhine. 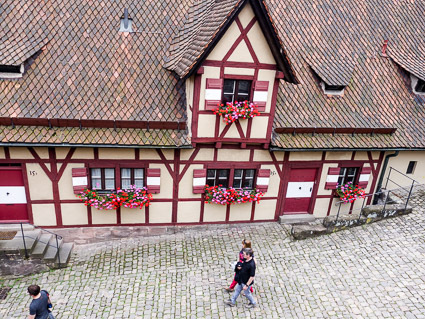 Tip: If you're cruising to or from Nuremberg, we strongly recommend that you spend at least a couple of nights in the city center. 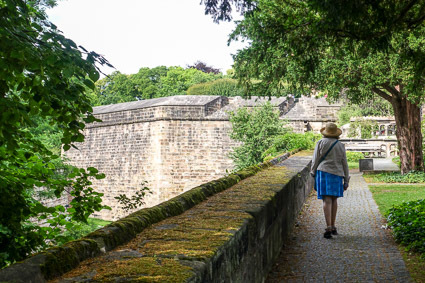 There's a lot to see, and the few sights that aren't within the old city walls are easy to reach by public transportation. 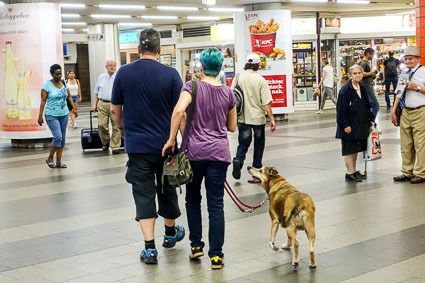 We arrived at Nuremberg's Hauptbahnhof (the city's main railway station), which is easy to reach from the airport by U-Bahn or from Erlangen, where we'd spent several nights, by regional train or S-Bahn. 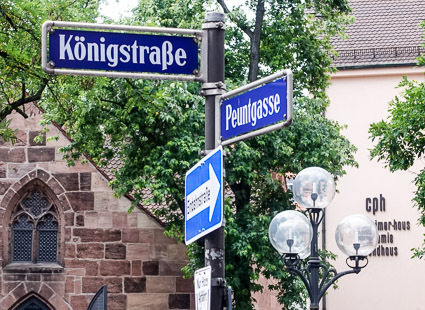 From the station's lower level, we followed the signs for Tourist Information to the Altstadt, or Old City, where we found the Königstrasse just inside the city walls. 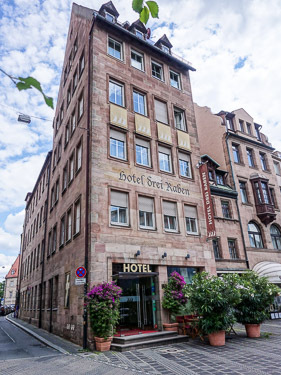 It was only about five minutes (at most) to the Hotel Drei Raben, a four-star boutique hotel where we'd made reservations through our hotel partner, Booking.com. 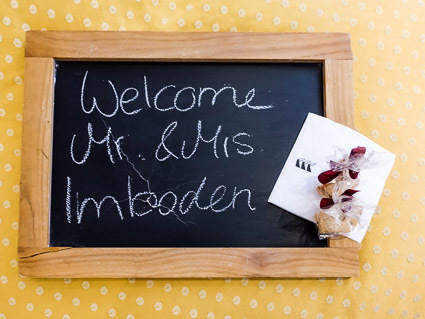 We were welcomed to our room with a message on a blackboard and cookies in the shape of ravens (Raben). 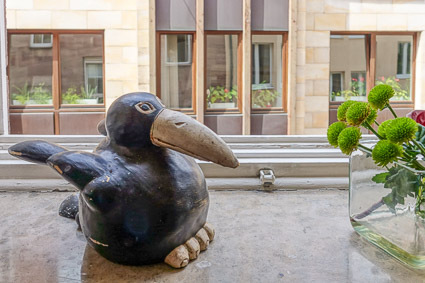 A sculpture on the windowsill featured the hotel's mascot(s). 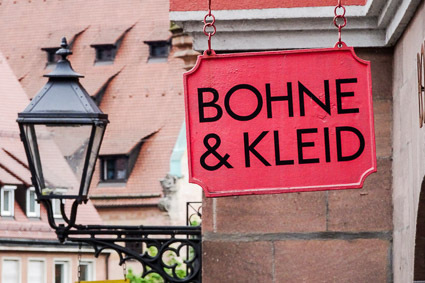 Every room at the Hotel Drei Raben has a different theme. 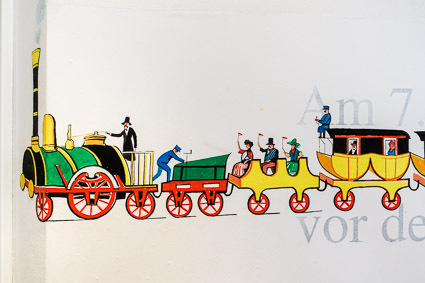 Our room's wall graphic honored the steam locomotive Adler ("Eagle") and the Gesellschaft zur Errichtung einer Eisenbahn mit Dampffahrt zwischen Nürnberg und Fürth, which was the first railroad in Germany when it opened on December 7, 1835. 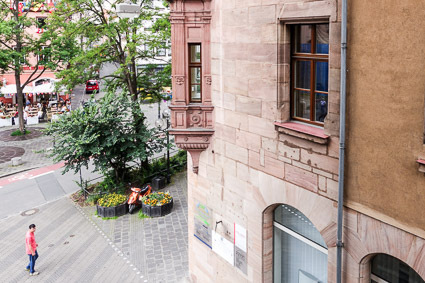 From our windows, we could see the Königstrasse and a traditional-looking building next door. 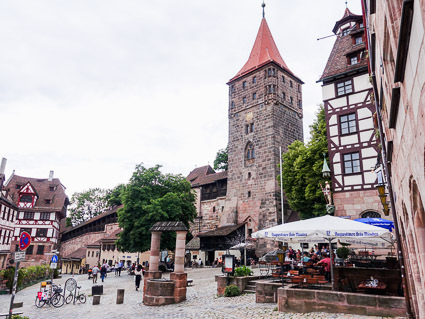 After unpacking, we went for a long walk in Nuremberg's Altstadt, which had changed quite a bit since Cheryl had visited regularly from her home in Erlangen during the late 1950s. AA block or two from our hotel, we saw a brass band performing on a square. 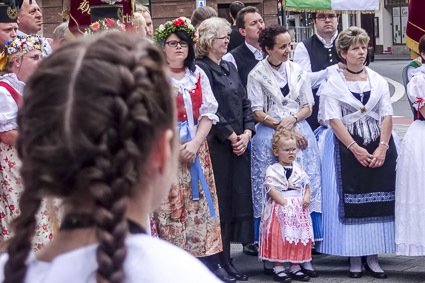 Groups of people in Trachten, or traditional costume, from towns throughout Franconia stood by as the band played. 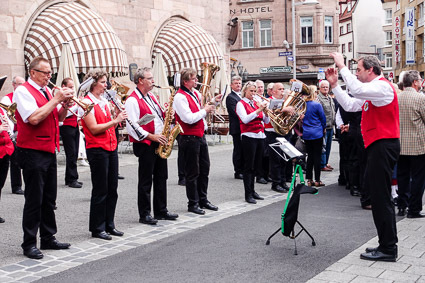 When the band had finished, spectactators waited patiently as local civic and church officials took turns giving speeches. 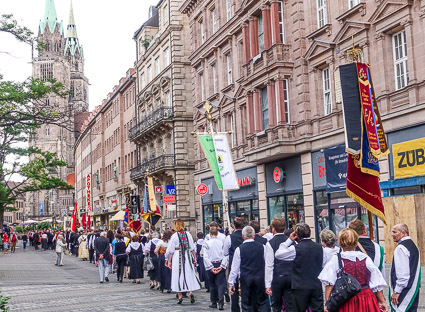 We never did figure out what the event was, but when the speeches and music were over, the crowd formed a procession and marched toward the center of the Altstadt. 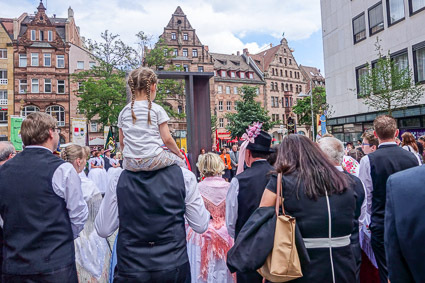 We went on a procession of our own, passing the Hauptmarkt and the Frauenkirche (a.k.a. Church of Our Lady). 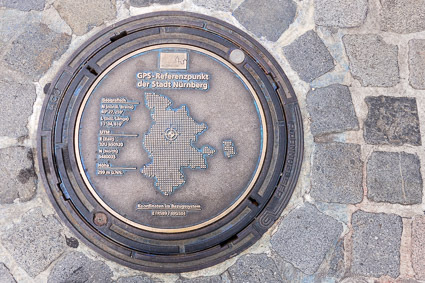 A manhole cover identified our location as the GPS reference point for the city of Nuremberg. 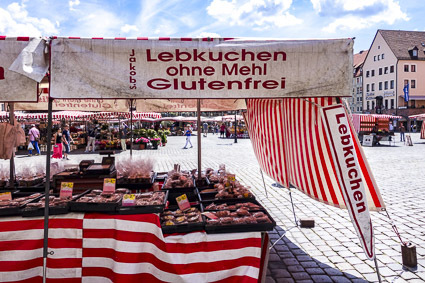 On the Hauptmarkt, vendors were selling produce and other edibles that ranged from oversize cherries to gluten-free Lebkuchen. 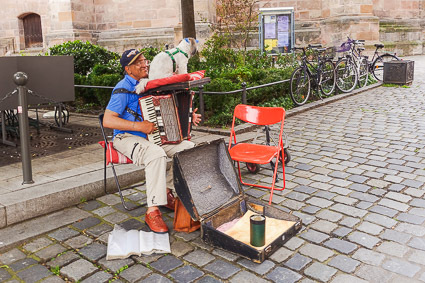 Just up the street, a busker performed on the Rathausplatz in front of City Hall. 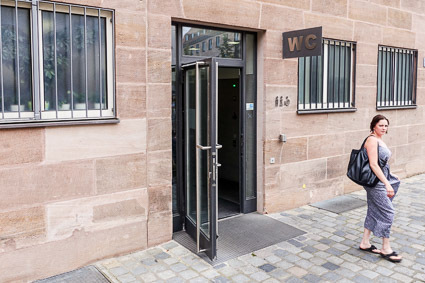 The Rathaus had a typically German concession to practicality: a public lavatory facing the street, with a modest admission fee of €0,50. 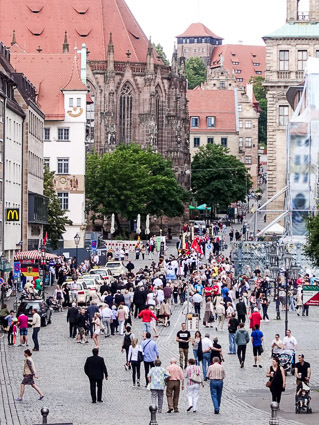 Even though it was a Sunday, many people were window-shopping in the city center, which had a wide range of shops and department stores. 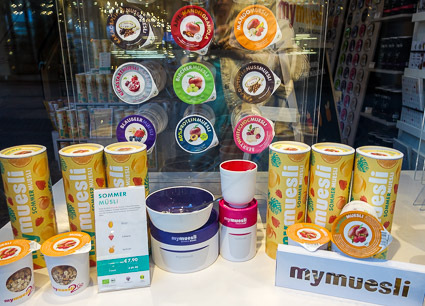 If we'd been hungry, we could have come back on Monday to buy custom-formulated Muesli. 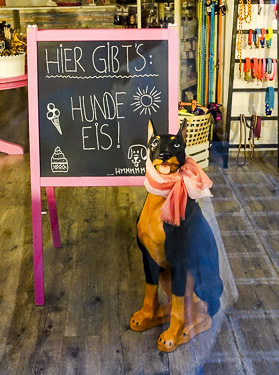 Or, if we'd been from the Internet (where nobody knows you're a dog), we could have shopped for canine ice cream. This store sign literally means "Bean and Dress." Obviously, the owner of the clothing and accessory shop couldn't resist the play on words. 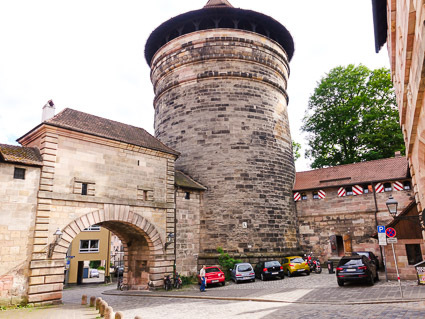 We continued walking until we reached the Kaiserburg, or Imperial Castle, at the northern end of the walled Altstadt. 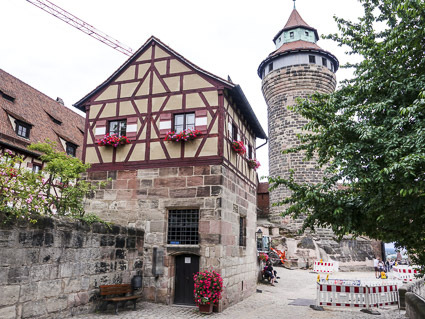 The castle is Nuremberg's premier tourist attraction, and it's open daily year-round. 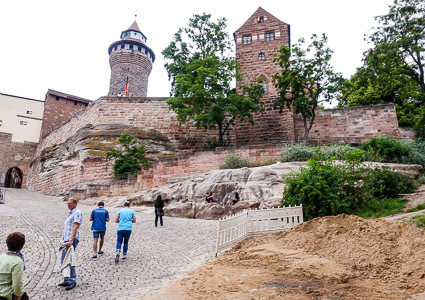 We were too jet-lagged to enjoy a museum visit or guided tour, so we simply went into the Castle Gardens (free admission) to enjoy a panoramic view of Nuremberg's rooftops. 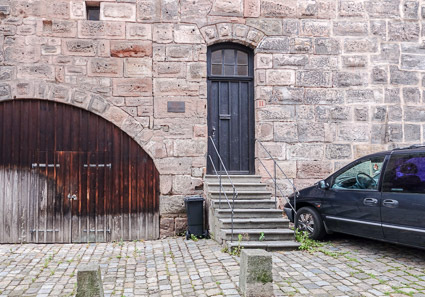 Click here and maximize your browser window for a larger panoramic image. 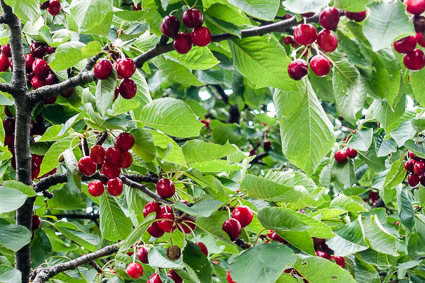 The adjoining Maria Sibylla Merian Garden was a pleasant walled garden with a lawn, benches, and a variety of plantings--including this cherry tree, which was heavy with fruit. 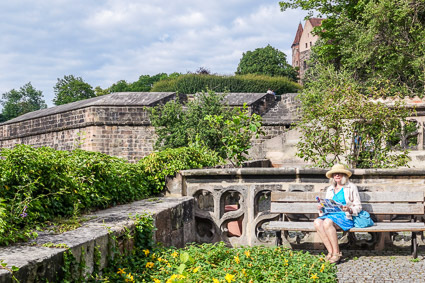 Note: Admission to the Maria Sibylla Merian-Garten is free, but the garden is open to the public only on Sunday and Monday afternoons from April to October. The Well House and Sinwell Tower are in the castle bailey. 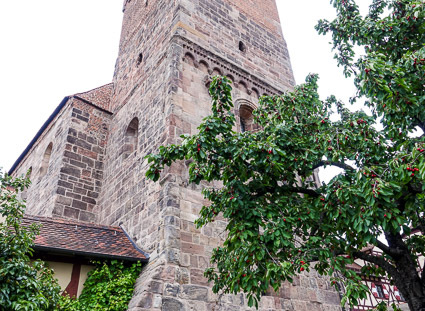 Visitors can climb up to a platform inside the tower for a bird's-eye view of the Altstadt. 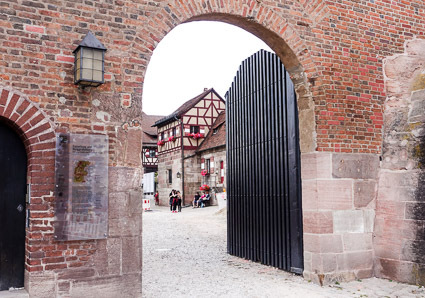 The lower gate led us outside the castle, where we could see the Kaiserburg&'s massive foundations. 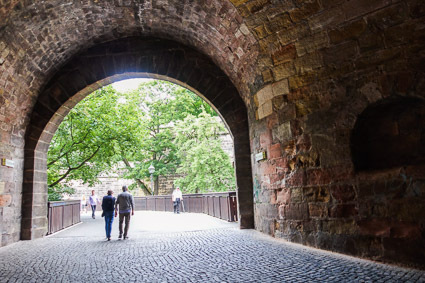 Instead of retracing our route, we bore right as we left the castle and followed the city's medieval walls dowhill.We soon reached the Tiergartenplatz. 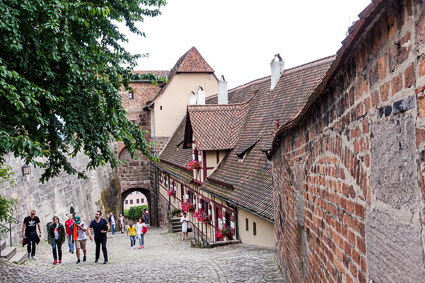 The Tiergartentor, or Zoo Gate, led to neighborhoods outside the Old City's walls. 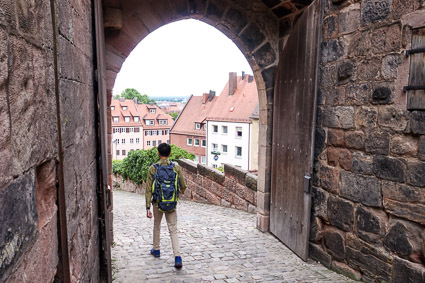 Continuing downhill, we reached the Neutor, or New Gate. 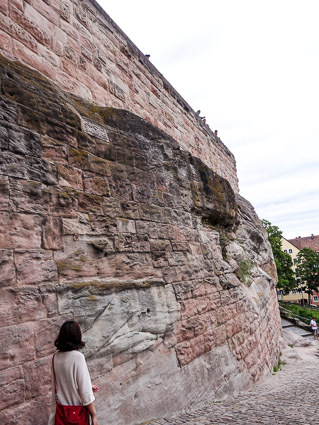 A flight of stone steps took us to a park on top of the massive walls. 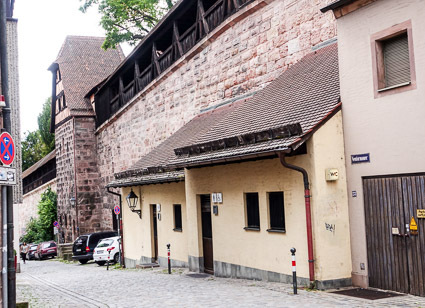 Nuremberg's fortified walls are occupied by apartments, businesses, and at least one public WC. 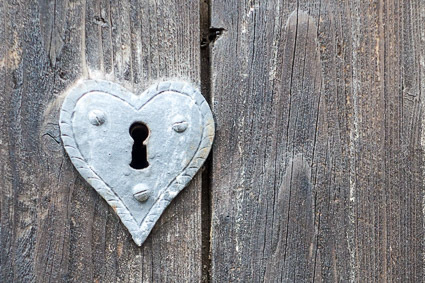 "I ❤ Nuremberg" may be a concept that predates bumper stickers and t-shirts: We saw this heart-shaped lock on an old wooden door in the city walls. 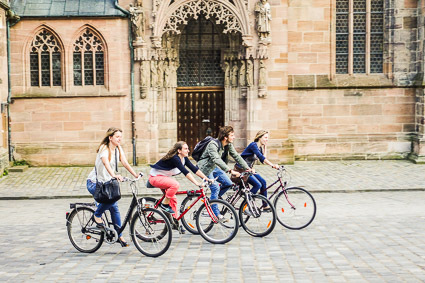 Later, after further explorations of the Altstadt and a free glass of wine at our hotel, we walked to dinner near the Sebalduskirche (St. Sebald Church), passing bicyclists along the way. 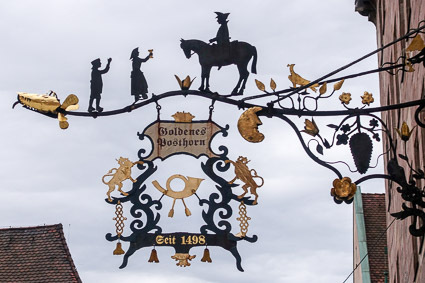 We ate at the Goldenes Posthorn, a traditional restaurant with outdoor tables and a menu of stick-to-your-ribs Franconian food. 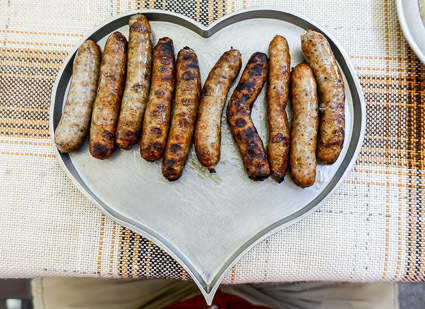 What could have been more appropriate for a romantic dinner in Nürnberg than a heart-shaped platter of Nürnberger sausages? 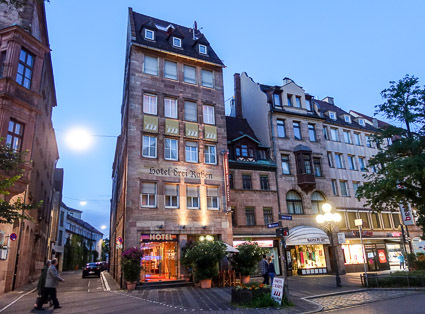 After a long day, we were happy to return to the Hotel Drei Raben, where a comfortable bed awaited us.